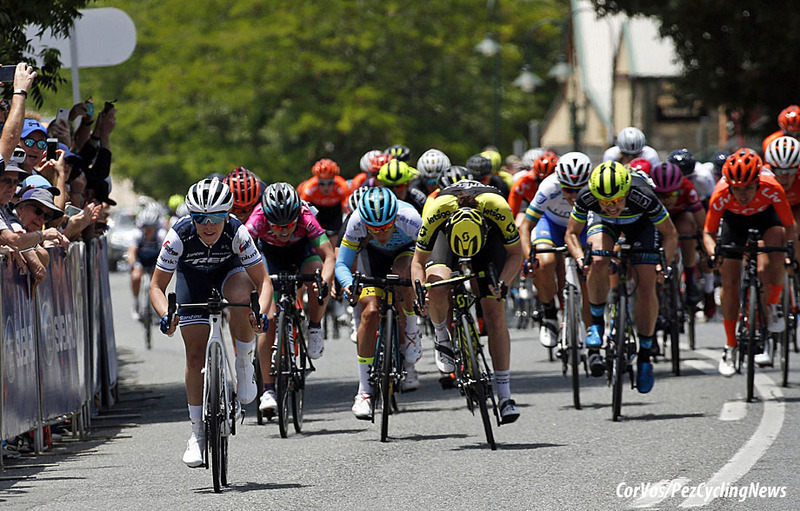 PezCycling News - What's Cool In Road Cycling : How Many Sprints are There in a Field Sprint? How Many Sprints are There in a Field Sprint? 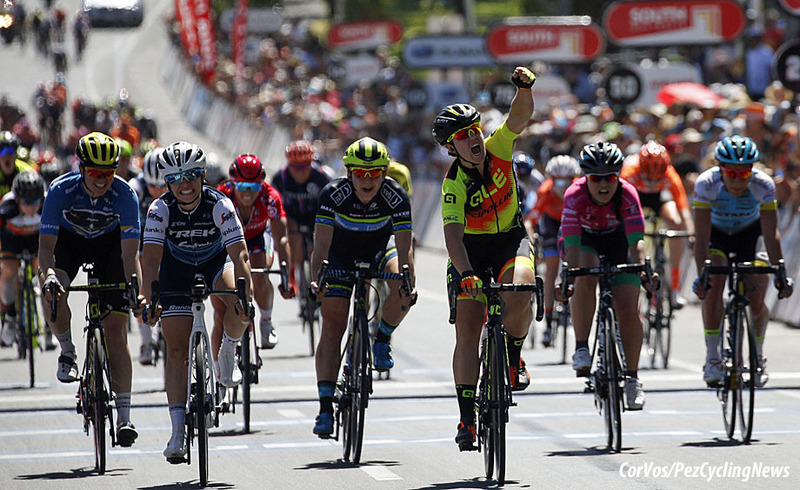 It’s still just January, but we’re already being teased with some terrific field sprints down under in Australia by both the women and men at TDU and Cadel Evans races. Elia Viviani’s Stage 1 win at TDU seemed to be propelled by turbojets, not to mention raw nerve squeezing through a narrow gap at the barriers. Much of the existing research into pro cycling has analyzed the power requirements of individual stages or multiple-day stage races. Another ripe field of research is optimal pacing strategies for time trials of different durations and over different terrain and conditions. Surprisingly, despite the increasing prevalence of scientific analysis into cycling, relatively little research has targeted the specifics of sprinting. 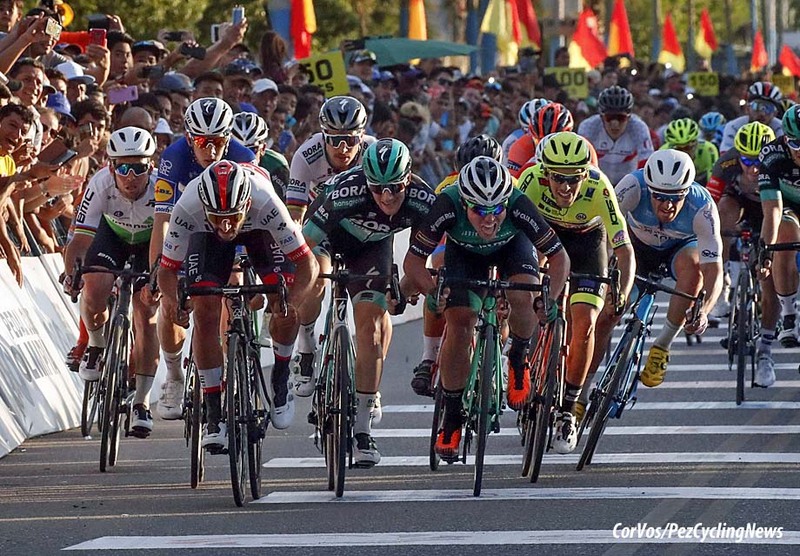 I’ve previously analyzed the determinants of success for Mark Cavendish, and just last month the aerodynamics of the extremely low and forward sprint position of Caleb Ewan. But what about the race within a race in the melee leading up to the final sprint? We intuitively understand that the riders aren’t just rolling easy for 5-10 min in an easy gear and then sprinting all-out for the final 200 m. Yet that’s how most of us train for sprints. • Power output from 31 races finishing in bunch sprints from 2014-2017 were collected from 7 WorldTour cyclists (64 kg, 170 cm). Riders were from 3 different teams, such that power meters were not standardized. • Race placings were 1st (8 files), 2nd (7), 3rd (5), 4th (10), and 5th (1). • The final 1 min were examined to determine the final sprint. From this, the sprint duration, distance, and mean/peak PO, speed, and cadence were calculated. • The final 20 min were isolated and the mean maximal power (MMP) over 5, 15, 30, 60, 240, and 600 s were calculated. 80% of each of these values were used as a threshold. • The final 20 min were then examined again to see how many efforts at each MMP were performed. For example, how many times did the athlete have to do a 15 s burst at >80% of her 15 s MMP? Considering how many cyclists keep their training and racing data as secretive as the recipe to Coca-Cola, it’s indeed a treat to get access to actual race data from WorldTour pros. What did the sprint analysis reveal? • Overall race duration averaged 179 min at an average PO = 167 and speed of 37.9 km/h. Race elevation averaged 426 m.
• The final sprint averaged 326 m long and 21.8 s, for an average speed of 53.8 km/h. Peak/mean PO were 886/679 W, which works out 10.6/13.9 W/kg. • MMP values over the final 20 min were 825W (5s), 702W (15s), 565W (30s), 426W (60s), 274W (240s), and 222W (600s). • For efforts of >80%MMP, there were more efforts at 5s (3 efforts), 60s (1), and 240s (2) compared with 15s, 30s, and 600s (1 each for all). • Analyzing the entire race broken down into fifths (i.e. for the ~180 min race duration, the race was broken down into 5x36 min quintiles), significantly more 5, 15, 30, 60, & 240 s efforts were require during the final 5th of the race than any of the other quintiles. So the requirements for hard bursts was the most in the final stretch of the race. This reinforces that road racing is often about energy conservation, and also having enough endurance to backload the hardest efforts when already tired, rather than just being able to crank out power when fresh. • When looking at how many times 15 s power at greater than 80% of the power during the final sprint (i.e. 80% of 679W, or an average power of 543W over 15 s) was required, 68 such efforts were required. Most such efforts occurred equally during the 2nd, 3rd, and 5th quintile of the race, with relatively few during the 1st and 4th quintiles. I think that there are a few interesting lessons to be learned from examining this treasure trove of actual pro race data. This is NOT to take anything away from pro women, but the race profiles examined here likely aren’t far off from many Cat 1/2 or top master’s men races. Therefore, the analysis is especially interesting. The biggest lesson, as I hinted at above, is that even a flat sprinter race is NOT just about the final sprint. There are numerous bursts of hard effort throughout the race, and much of it is back-loaded. This requires aerobic endurance to recover, stamina to go hardest while already fatigued, and smart riding to hide in the pack and minimize energy use and fatigue. Sprinter courses/races aren’t even just about short bursts. Not only do you need that short 5 s effort, you have hard bursts of 60 and even 240 s. So the old adage is true, in that you can have a world-killing final sprint, but you still need to get there first! Sprint durations were longer than the typical 150-200 m that we often think about. At >300 m and >20 s, we need to really practice long sprints and sustaining that final burst. Sprint fast and have fun! Stephen Cheung is a Professor at Brock University, and has published over 110 scientific articles and book chapters dealing with the effects of thermal and hypoxic stress on human physiology and performance. Stephen’s new book “Cycling Science” with Dr. Mikel Zabala from the Movistar Pro Cycling Team has just hit the bookshelves this summer, following up Cutting-Edge Cycling written with Hunter Allen.